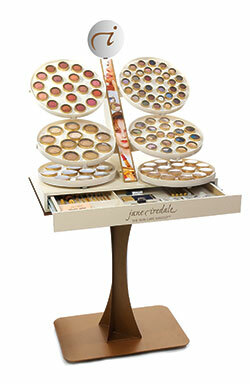 Jane Iredale, The Skin Care Make-Up™ is just an extension of skincare. Introduced in 1994, the Jane Iredale range of mineral cosmetics was the first full Make-Up line to offer not just colour enhancement but real benefits to the skin. Free from the top three sensitisers – synthetic dyes, fragrance and chemical preservatives, this mineral Make-Up line is a boon to those who value purity. As a former casting director and producer working with top actresses whose complexions had to be perfect, Jane Iredale saw the need for Make-Up that would offer not just colour enhancement but also benefits to the skin, and which would mask imperfections without irritation and not cause spots. Based on micronised minerals and made without fillers the Make-Up gives flawless, long-lasting coverage with minimal product application. From her numerous shades of Make-Up base for every skin tone to her lip colours, plumpers and glosses, lip and eye pencils, blushers, eye shadows, mascaras, primers, concealers and facial spritzers, Jane always includes extra natural ingredients in each product that are not found in conventional cosmetics. Her versatile range adds care to colour – conditioning, moisturising and protecting.